In order to safeguard against financial frauds and losses, such as, check cashing fraud, card skimmers, and many other risks associated with checking information, depositors prefer to choose secure payment methods like cashier’s check or money order, as these are considered safe modes of payments compared to conventional checks and debit cards. Both cashier’s check and money order have payment guarantees attached to them, due to which, sellers act in good faith and ship goods and provide services before full payment is received. What is Money Order and Cashier’s Check? Money order is a type of payment method in which the full payment is made up-front instead of withdrawing it when recipients cash it. This is the reason why it is considered as a safe payment option as compared to having a checkbook that has personal information in it. The maximum limit of money order is usually a thousand dollars, and a few cents are charged on a couple of dollars to make a purchase. There are different institutes where this mode of payment is available, such as, gas stations, convenience stores, retailers, post offices, etc. Cashier’s check, on the other hand, works the same way as money order with one exception, i.e., they are only provided by the financial institutions. Just like money order, in case of a cashier’s check, the payment is made up-front, and the funds are guaranteed by the bank. They are comparatively expensive to buy. However, you can use it to make payments of huge amount. Although, both of these methods have many similarities, yet, there are certain differences between the two that are discussed below. As already discussed, money order is usually capped at $1000, and it might be difficult for you to find a money order that is worth more than $1000. However, the issuer decides the actual limit of this mode of payment. On the other hand, you can get a cashier’s check for a lot higher limit as it is most commonly used for a down payment on a property. Where is Cashier’s check and Money Order Available? The cashier’s check is generally available at banks where you have an account, because it is usually issued against your account and it is more of a challenge to get it without a bank account. If you do not have an account at that bank, it will become very difficult for you to get a cashier’s check without delay. It can be ordered via mail, fax or online, but the banks might put a restriction on where it should be sent and who it is payable to. Money order, on the other hand, can be bought from different establishments, such as, retailers, grocery stores, post office, etc., and you can also get it from some banks. The cashier’s check is considered as a more secure mode of payment as compared to money order, because these are drawn against a bank account. Therefore, money order is not usually accepted as a substitute for a cashier’s check. Being on the safe side, you should also know that cashier’s check, sometimes, can be used in frauds, and other scam activities. Due to the nature of a cashier’s check, they are comparatively costly than money order. However, there are certain situations where cashier’s check can be less costly, for example, if you have to make a huge payment, and you pay it with a single cashier’s check instead of using multiple money orders, the cost of single cashier’s check will definitely be reasonable and less expensive than a money order. If any of these instruments are lost or stolen, it is easier to get a replacement or get your money back if you are using a money order. However, in case of a cashier’s check, you may have to wait 90 days, which can be very frustrating, since a huge amount of the cashier’s check will stay stuck during that period. Hira Waqar. 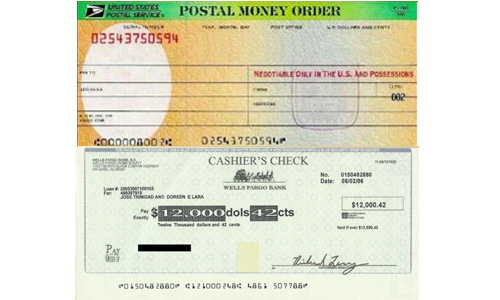 "Difference between Cashier’s Check and Money Order." DifferenceBetween.net. December 10, 2014 < http://www.differencebetween.net/business/difference-between-cashiers-check-and-money-order/ >.